Buy 2 Nights, Get 1 Free Through the Month of April! It doesn't get any better than this! AS GOOD AS IT GETS delivers what you are looking for in a Luxury Mountain Retreat. The HUGE Glass and Beam windows on both sides let in all the splendor of the mountains to compliment the beautiful custom decor. The grand living room features a see-thru Stone fireplace between the den and dining area, while the 32" LCD TV is complimented by a Home Theater System for your viewing enjoyment. With 3 complete Master Suites, each with King Log Beds, LCD TV's with DVD's and private bath's; 2 of 'em even have their own private decks! There are also 2 exrta twin roll away beds for the young 'uns. "This is As Good As It Gets" is what you'll be saying as you enjoy the lofted game room with beautiful mountain views as you play Pool or watch the Big Game on the Flat Screen. Out on the deck high above the tree's you'll find the Hot Tub, a Porch Swing, and a great gas grill! Make your next Smoky Mountain Getaway AS GOOD AS IT GETS! Enjoy hassle-free arrival and check in with directions and key codes right on your mobile device when you reserve with us and download our free app! We brought the entire family for a Rod Run weekend and enjoyed our stay! It was big, beautiful, and clean ! We will definitely be back! Amazing views in this large and very clean cabin. We really enjoyed our time there. The place had everything you could want for a weekend getaway. It was in a secluded area, but still close enough to get to town quickly. Beautiful Cabin with an amazing view. Loved the kitchen. Washer and dryer worked well. Photo's are accurate. We arrived around 8pm on a Friday night. The TV's were already on but the only channels you got were free or infomercials and we did not have wifi. After calling the office a few times we were told that it was a technical issue and could not be check on until the morning. I had the sales manager cell phone number so I called her at home and the tv was on in about 45 mins. The technical problem was no one paid for the direct tv service, still no wifi. Saturday had to call them again about wifi, but the maintenance man could not find the cabin. Called again Sunday. They called back and said the maintenance man got on wifi. He got on the cabin next door not for this cabin. He was at the cabin reinstalling the wifi around 4pm. Finally it got fixed. We bought some meat to put on the grill, but that didn't work either. It was not connected to any propane. The day before we left it rained very hard and had some hail. When we got back to the cabin, there was water all over the floor near the back door. The back doors do not shut very tight. The roads to the cabin are very steep and the driveway is terrible. The website said that there was Air Hockey, there is not. It's hard to enjoy a vacation that you paid for in advance with all these problems. We have stayed at other cabins in the Smokey Mountain and have never had any problems. We will never stay with Summit Cabin Rentals again. Thank you very much for taking the time to provide a review of your stay! We are very sorry you were disappointed in our cabin, but we hope to have you stay with us again so we can make it up to you. When we heard you were without WiFi and TV service for the first hour of your trip, we immediately called the Satellite and Internet provider at 9pm that night and got it straightened out. The bill had been paid just credited to the wrong account. The grill does work and is connected to a large propane tank which also runs the fireplace, we would have been happy to assist you with it while you were in town, but we did not know you were having problems with it. The road to the cabin is in the mountains with curves and slight inclines, but it is paved and accessible with 2WD vehicles. Beautiful Cabin in the Mountains! The cabin looks just like it does in the photos. It was decorated beautifully and is exactly the type of cabin I think of when I envision a trip to the mountains. 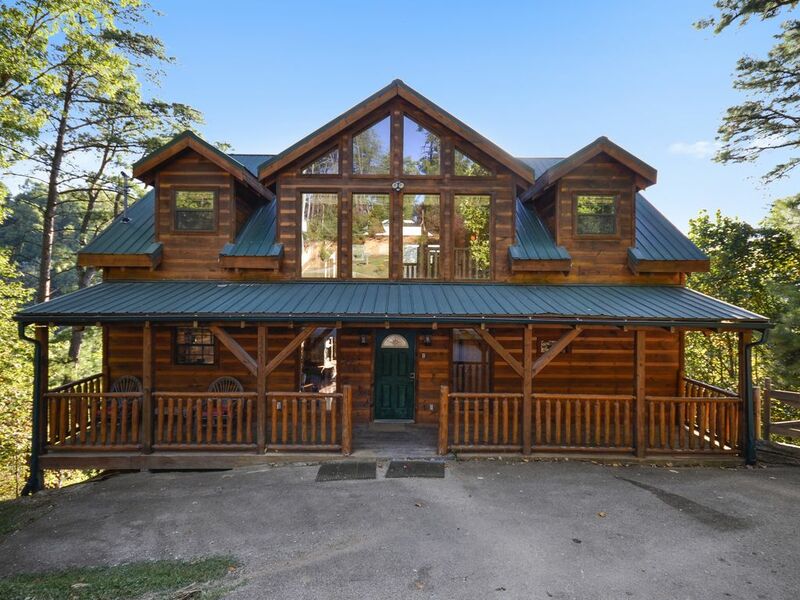 I don't think the description above does this cabin justice. The view from the back deck is breathtaking! It is located on a steep, gravel road that was a bit difficult to drive on - our tires spun a bit on the loose gravel and we were driving a Ford F250 truck. At night we watched a handful of cars struggle to make it up the mountain. My advice is to only make one trip up and down the mountain a day if at all possible. We stayed in this cabin with our 14 month old and with two other families and their 13 month olds. The upstairs bedrooms fit a Pack 'n Play in each one, we bought a cheap wooden gate to put at the bottom of the stairs to keep them from climbing, and one of the families brought locks for the cabinets. With a bit of child-proofing it is perfect for children. The pictures of the parking make it look flat but it is an odd shape. Two SUVs could fit okay probably. We had three vehicles and it took a bit of thought to figure out how to fit all three when we first arrived. There is a Wii but no games to play with it. We had an issue with the hot tub leaking but it was fixed quickly. And when we arrived the sink was full of dirty water. Other than those issues, the cabin was great! Our stay was good, however please be advised the gravel "washboard" road is hard to drive on. There needs to be more than the 1 cast iron frying pan for cooking, and the seal on the refrigerator needs to be looked at. It did not keep the stuff cold enough. The family room needs to be mopped and the carpet in the game room needs to be cleaned since there were several stains on the carpet. The picture of the front of the cabin is mis-leading as it looks flat and it is not. The driveway is very steep and has very little parking space. The mountain view is good and the hot tub was great. I was very thankful that the hot tub was not too tall, as I have had in the past, it was easy to in and out of. We did not come down off the mountain but twice because of the bad condition of the gravel road. With all this being said, we did have a good time spending time with the family in the beautiful cabin on top of the mountain.